After another few years, and a generally positive response to the DS re-release of the previous two games, a proper third title in the series was released for the Nintendo 3DS. 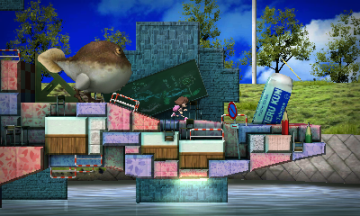 Sayonara Umihara Kawase (or “Farewell Umihara Kawase”, if you will) was developed by Agatsuma Entertainment, though series creator Kiyoshi Sakai was still heavily involved in its design. 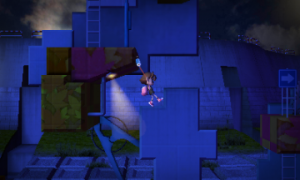 It retains much of the core platforming mechanics of the previous games, but updates the overall design of the game to something a little more modern. The biggest change is that limited lives are no longer a factor in the main game. 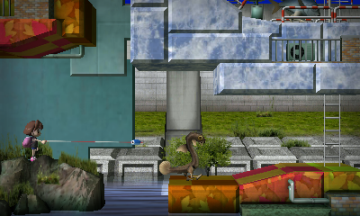 Instead, progressing through the game simply unlocks new levels on a map grid. 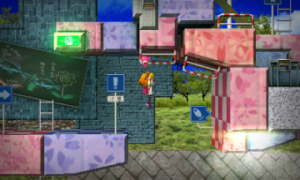 Multiple exits are still present in certain stages, meaning that pathways from one end of the map to the other are sometimes a bit knotted and hard to follow. The different paths eventually lead to one of five endings, each of which closes out with a boss fight. Hidden backpacks can still be found along the way, though these are treated merely as collectibles. 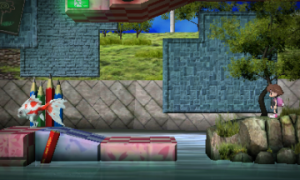 Once at least one ending has been reached (the path from stage 0 to stage 9 is pretty quick and easy), you unlock Survival Challenge, which starts the player off in stage 0 with 3 lives, as in the previous games. Another noteworthy change is that there are more playable characters this time around. 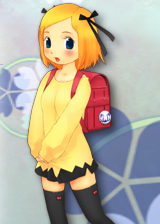 The main character of the previous games. Has no special ability. 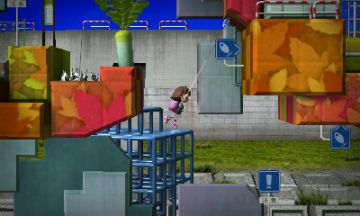 There is also a childhood version of the main character, who can restart each stage from a checkpoint, but only once per try. 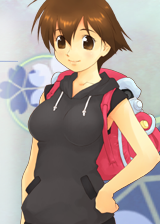 A childhood friend of Umihara’s. 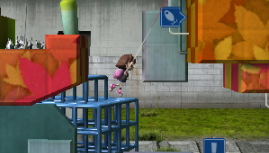 She has the same checkpoint ability as childhood Umihara. 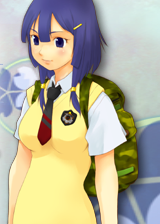 A future descendant of Umihara’s, Noko is a time travelling police officer. She has the ability to move in slow motion. Levels still consist of pretty much the same basic elements as the previous games, but it feels like a lot more thought and care was put into level design this time around. Enemies no longer spawn freely (outside of some specific stage gimmicks) and their placement is generally fair and logical. Much like Shun, much of the challenge here involves figuring out how to navigate some truly vicious platforming. There’s no shortage of spikes and icy surfaces to be found, as well as the newly added trampolines, which have their own springy physics and are often placed at odd angles. You can press the left shoulder button to temporarily freeze time in order to get a read on your situation, as well as bring up a diagram showing which direction you’re currently pressing on the d-pad. If you’re playing as Noko, this ability is replaced with temporary slow-mo, which is far more useful. The bosses will surely look familiar to series veterans, like the first fight against a giant tadpole, but they’ve been reworked to feel a lot more like an actual boss fight, so you need to figure out a way to get them to injure themselves while avoiding them. Unfortunately, they’re kind of the weak link in the chain, as the limits placed on your abilities means you still end up fighting by somewhat indirect means. One last notable improvement is how good a job this game does at tracking stats. A profile screen keeps track of how many stages you’ve cleared, how many exits you’ve reached, and how many backpacks you’ve found. Each individual stage keeps track of how many times you’ve succeeded and died in that stage (which can lead to some pretty embarrassing ratios, especially if you’re not very good) as well as your best time for each exit on that stage. Best times are also uploaded onto a leaderboard, and since playing as alternate characters can make clearing certain stages easier, there’s an option in the settings to filter out times wherein those characters were used. Gone, sadly, is the hand-drawn sprite art, replaced with 3D character models. 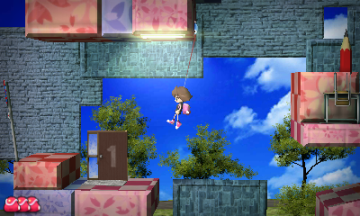 The enemies manage to survive the transition pretty well, but Umihara and the other human characters end up looking pretty strange. Being polygonal just seems to emphasize their odd proportions, particularly the large hands and pencil-thin arms and legs. Backgrounds and graphics in general are underwhelming, and the camera has this strange way of shifting around very slightly as you move around. It痴 indented to emphasize the 3D effect, though it just ends up being distracting. The framerate is also capped at 30 FPS, and in general the game feels slightly slower and more sluggish than its purely 2D predecessors. The music as as cheesy as ever, though many of the tracks seems to revolve around similar motifs, so the soundtrack as a whole feels a little more cohesive. The lack of a map on the bottom screen, like in the DS game, is also a bummer. 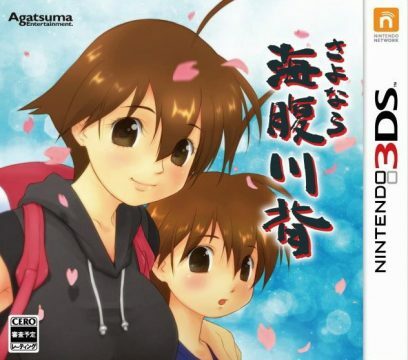 About a half-year after its release in Japan, Sayonara Umihara Kawase became the first game in the series to officially cross the pond, when Natsume released the game as a download only title in North America. It was released as Yumi’s Odd Odyssey, a name they’d planned to use for the PSP port of Shun before the stateside release of that game fell though. Umihara’s name was changed to Yumi, which is at least easier to pronounce in English, and while there’s no mention of her original name, the game’s text doesn’t try to cover up references to previous games in the series. The only other change that’s immediately apparent is that the North American leaderboards are separated from the Japanese ones. The European versions is the same but keeps the original title. A Vita port was also released in 2015. This version was published directly by Agatsuma worldwide, and keeps its original moniker, though it’s known as Sayonara Umihara Kawase+. It looks nicer, as it’s displayed at a higher resolution and runs at 60 FPS. 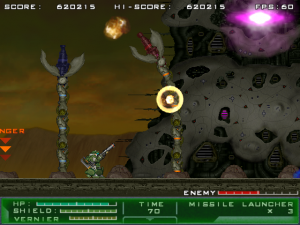 It includes several new levels and rebalanced enemy placement, as well as a port of the original Super Famicom game, complete with a practice mode, making it the first time that the original title was released outside of Japan. A PC port was also released in 2015, though it’s pretty much just a straight conversion of the Vita version, and runs in the native Vita resolution. 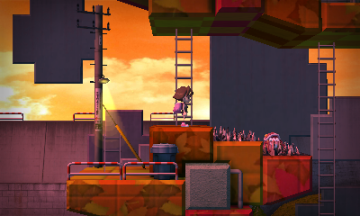 Indie Before It was Cool: The Umihara Kawase Story An excellent interview with Kiyoshi Sakai.